Martini glasses by Deacon crafted of 24% lead crystal. The bowl of the glass features an elegant, hand-cut swirl pattern. Sold singly, with matching champagne flutes, double old-fashioned glasses and Martini shaker. This is Page 1 of a two-page article about the Martini, beginning with the Martini history. Click on the black link below to visit Page 2. Before there was a Martini cocktail, there was Martini & Rossi vermouth. * In fact, if you order a Martini in Europe, you’ll get a glass of Martini Bianco (white) vermouth on the rocks with a lemon twist. The brand was created in 1863 when Luigi Rossi and Alessandro Martini started a vermouth bottling plant in northwest Italy. stirred in a highball glass filled with ice, topped with soda water and garnished with an orange wedge and a lemon twist. The Manhattan, first mentioned in print in 1884 (Manhattan recipe—rye, sweet vermouth and bitters. The Martinez, considered by many to be the precursor of the Martini (first mentioned in Jerry Thomas’ The Bar-Tender’s Guide in the 1880s—the first edition was published in 1882). You might not agree when you see the Martinez recipe: 1 oz. gin, 2 oz. sweet vermouth, 1 dash oranges bitters, 2 dashes maraschino liqueur; stir with ice, strain into cocktail glass, garnish with lemon twist. The Negroni, created in 1919 by bartender Fosco Scarselli at the Bar Cassoni in Florence, for a regular patron, Count Camillo Negroni. Negroni had asked for an Americano cocktail with a dash of gin. Negroni recipe: 1.25 oz. gin, 1.25 oz. Campari, 1.25 oz. sweet vermouth, stirred with ice and strained into chilled coupe or over ice in a chilled rocks glass, garnished with an orange twist. As vodka ascended in the 1980s to become America’s favorite spirit, more people began to have vodka Martinis instead of the classic recipe, made with gin. But this article restores the Martini to where it should be: made with gin. Gin is distilled from juniper berries (some people have begun to distill grapes), along with up to a dozen or more different aromatic herbs, spices and other flavors, like citrus zest. As a result, gin is much more flavorful than vodka, which is an unflavored grain alcohol distillation. The earliest legend has the invention in San Francisco around 1850. A bar owner, Professor Jerry Thomas, was offered a nugget of gold by a miner, to create something special. The miner was en route to Martinez, California, hence the name. A stronger claim to the Martinez is made by the city of Martinez itself. The claim is that the Martinez was made in 1870, by a bartender named Julio Richelieu. The recipe called for gin and sweet vermouth instead of dry vermouth, plus bitters and an olive. A recipe for the Martinez was first published in 1867, in The Bartenders Guide. The Oxford English Dictionary gives the credit to Martini and Rossi, then called Martini e Sola, in 1871. Solo was one of the original partners in the vermouth bottling plant, but the Sola family sold out in 1879. A cocktail recipe book, The World's Drinks and How to Mix Them, copyright 1907, gives the recipe for Dry Martini Cocktail from a Los Angeles bartender. Made with gin and dry French vermouth, served with lemon peel and an olive, this recipe included two dashes of bitters but otherwise is similar to a modern Martini. Some New Yorker sources insist that a bartender at the Knickerbocker Hotel, named Martini di Arma di Taggia, invented the Martini in 1911 for America’s first billionaire, John D. Rockefeller, co-founder of the Standard Oil Company. True or not, it seems to be the first time the Martini made its way to Wall Street, and them Madison Avenue, where the “three Martini lunch” was a standard among executives for decades. By the way, Rockefeller’s Martini was made with London Dry Gin, dry vermouth, bitters, lemon peel and one olive. 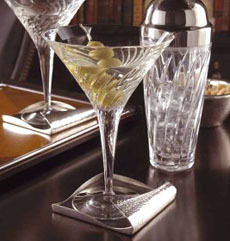 The first reference to a vodka Martini in the U.S. occurs in 1951 in a cocktail recipe book, Bottoms Up, by Ted Saucier. Whether it sprang from San Francisco, Martinez, Los Angeles or New York City, the popularity of the Martini waned 100 years later along with all cocktails, in the wine-and-spritzer-focused seventies. But it reclaimed prominence in the late 1980s, when the newly-popular vodka, abetted by the Absolut vodka advertising campaign, replaced gin as the base spirit. The vodka Martini became the rage. By the 1990s, popular variations proliferated: the green apple Martini (appletini), the chocolate Martini, and so forth. Specialty menus featuring more than a hundred varieties of “Martinis” appeared from coast to coast. A dry Martini adds a drizzle of dry vermouth to the gin or vodka. An extra-dry Martini has just one or two drops of vermouth*. It’s almost like drinkining the spirit straight. A wet Martini is the opposite: more vermouth than gin or vodka. A perfect Martini is an equal proportion of vermouth and spirit. *Vermouth is an aromatized, fortified wine flavored with various botanicals: barks, herbs, flowers, roots, seeds and spices. Modern versions of the beverage were first produced in 1757 in Turin, Italy, and like most alcohol was used medicinally. In the late 19th century it became an ingredient in many of the first classic cocktails, including the Manhattan, the Martini and the Negroni. It can be substituted for white wine in cooking. The name comes from the German Wermut, wormwood, an ingredient in earlier versions of the drink. Today wormwood is best known as an ingredient in absinthe. The American cocktail crossed the pond and got written into Ian Fleming’s fiction in the 1960s. In the first Bond novel, Casino Royale, his recipe is specified as three measures of Gordon’s gin, one measure of Russian or Polish vodka, and half a measure of Lillet aperitif wine, shaken until ice-cold, and with a large, thin slice of lemon peel for garnish. This variation is properly called a “Vesper,” after his love interest in the book, Vesper Lynd (who perishes by the end of the book). By the second novel, Live and Let Die, Bond is drinking vodka Martinis, a trend that continued when the first Bond film was made in 1962, Dr. No.